Set in a near(ish) future, death is a thing of the past. A miracle ‘serum’ brings back the newly dead to life as socially-acceptable zombies. Strong, tough (after all, they are already dead), obliging, requiring little sleep and food (over-ripe meat, NOT brains), zombies are a new social group, campaigning for antidiscrimination and putting themselves forward for various jobs. Able to ‘heal’ any dropped body parts back onto themselves, but still fundamentally in a state of, albeit slowed-down, decay, there are zombie taxi drivers, zombie roadside car repair men, zombie lifeguards, zombie nightclubs and bars, and even a zombie Feast Day, promoted in response to anti-zombie attacks. Roy is a bit of an anally-retentive life-coward: he lacks great levels of ambition, or even curiosity, and stagnates gently in his accounting job, sharing a flat with his best zombie friend, Mac. After a drunken night out, Mac persuades Roy to take a leave of absence from his job and go for a road trip, tempting him with the chance to play shove-penny-fall games at the seaside (the height, at this point, of Roy’s levels of excitement). However, borrowing a camper van and hitting the road sets them on a course for a very strange set of events. Worser and worser, the serum could well prove to be unstable, leading to the eventual degeneration of zombies into mindless, brain-eating creatures. Mistaken for active pro-zombie campaigners, Roy and Mac are kidnapped first by an anti-zombie faction, escape, are recaptured (but in a nicer way) by a pro-zombie group, released, and separate after harsh words: the obligatory ‘low point’ of a buddy story. Roy ends up in prison; Mac spends time with a zombie commune in the now-permanently slightly flooded Fens. Once released, with a fat payoff for illegal incarceration (his charges dropped), Roy reunites with Mac and the friendly Fen zombies (although the gag about ‘logging on’ to the commune might make you wince), and they discover plots within plots within the corridors of power, and how the serum-controlling pharmaceutical company’s front is the pro-zombie movement. Dark doings are at work, here; power plays and big money. To strike a blow for the ordinary man and zombie, Roy and Mac decide to rescue the serum’s creator from company incarceration so that he can work on a cure for the eventual brain-eating monstrousness that all the zombies in the world might be on course for. All in all, there is plenty here for cinemascope imagining. If this was made into a film, and no doubt the author’s own film-fan leanings have heavily influenced the framing of the descriptive work, it would probably be a film with Simon Pegg and Nick Frost in it. Most likely as Roy and Mac. This is the thing we are aiming for: good hearted fun with a soupçon of social comment via satiric wit. The landscape of the future—socially and geographically—makes a lot of sense. The collapse of Great Yarmouth into the sea due to erosion and fracking, and the four-inch flooding of the Fens are very conceivable. As is the human response that came from the serum’s release. Revivification is through the NHS, naturally—a logical organ for mass dissemination within the UK, and it saves the NHS a packet on disease management. There are newspaper ‘clippings’ that explain the politics of zombie integration; the tabloid deciding they are the new all-round scapegoats, the broadsheet deciding on a more live-and-let-unlive policy of response—again, very typical and very believable. The attempts by various countries to revive authority figures from the past: and the disasters this led to (the entire zombification of Venezuela being one, when the revived leader went bonkers and demanded it), and the fact that countries did not learn from others’ mistakes and tried it ‘their’ way, to greater and lesser levels of embarrassing failure, as well as the desire by powerful elements in corporate business to have control over policy as well as product—all very recognisable. Witney has produced a solid base for his confection. But this is where the problems start, and the soufflé starts to wobble. Yes, the plot has pace, yes, it is suitably convoluted to make any fan of nonsense fiction and fantastical adventure fiction well satisfied, with streaks of The Man paranoia and bright bursts of violence and action, as well as tongue-in-cheek humour. 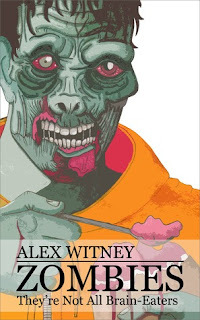 However, Witney appears to be very enamoured of his ability to write as wittily as his heroes of comic fantasy, and continually is striving to do so. Unfortunately, his efforts do not always work, and there are some clunky, awkward points in the narrative that it is hard to forgive him for, when one is getting into it and enjoying the thing. It interrupts the flow, man. There is character inconsistency, which makes for strange ‘hang on…’ thinking when the pace should be getting good. Roy is a slob, but clean and tidy; cowardly, but considers daring rescue; a man of few words, but a gibbering emotional hothouse. For the purposes of comic fantasy, one has to keep it cleaner cut, or make it a much simpler reveal of one’s character. Roy is, to read, unbalanced. Mac, too, swings from being a brainless grunt to being a thoughtful hero. Granted, a character can have many facets. But if you are aiming for buddy-movie dynamics, if you want to create a comic fantasy, where the real hero is always going to be the narrative inventiveness, then it is not good to have Dostoyevskyian character shifts and shading. Characters in comic fantasy are basically part of the toolkit. It takes a long time to allow them to develop—sometimes in long series, years in the making. But if you want comic action, then the comic action is your main protagonist. The characters are there to carry it. In attempting to make specific and amusing descriptions of the characters’ reactions and thought processes, Witney unfortunately got bogged down and the pace juddered. A good example is Mac’s severed arm. It has un-life of its own, and starts to make a monkey of things much as ‘Thing’ does in The Addams Family. But instead of using quick, broad strokes or amusingly loaded non-sequiteurs to describe what the arm is doing, and leave the reader to imagine the rest, Whitney tries to describe everything. And this is his problem; too many words, too much detail, in the wrong moments. The bouncy fun flattens like toothpaste on paper. The warm thrust of action was missing, too, in moments of characters’ overly reflective ponderings. The examination of the thoughts of inanimate objects was rather hit and miss. While the ‘death’ of Roy’s hire car in the Fens was quite sweet, the attempt to be clever with the inner life of a door that Roy and Mac sneak through as part of their scientist-liberating plan read as contrived and unnecessary. Such wordy events came across as a little too convoluted and self-congratulatory. Plus, they did not fit the style of the main body of the narrative: the character halts affected the pace; the anthropomorphic personification went against the general grain. The final issue I had was in the final few pages with the sudden cutting-off of the action—just as it was finally warming up and getting good, and finding a comfortable stylistic balance. Back home, Mac and Roy discuss the possibility it has all been a written apparatus, and now suddenly stopped by an author too lazy to continue at this time, and for a crude set-up for a series… although there are the odd moments in the text where the reader is invited to wink at the ‘life’ of the narrative with the author, again, these feel odd to say the least, and the ending, while ‘right-on meta-textual’ is the most clunking break of all. Comic fantasy has to create and maintain a complete world of its own devising, through which, with satire and invention, an author can play and develop whatever themes and messages they wish to experiment with. But the arena is a closed one. To break the fourth wall with comic fantasy is to lose its power and strength. What the book lacks is a sense of comfortable balance with itself. There is much of amusing promise here: a solid and steady hand with the background construction, two potentially very likable buddy characters, and a colourful set of daft and dastardly villains arranged against them (including the corporate stupidity of Roy’s boss and his job—exaggerated to give a breezy skit on office working life and what a person with half a mind has to put up with within the ‘machine’. Dude.). This is no Kerouac, nor Beat anti-establishment propaganda. However, zombies have always been firmly in the monster camp—the luminal, anti-social side of things. As such, do zombies have, perhaps, a distant kinship to those thinkers and writers who were critiquing the Establishment, who were fighting its excesses and ludicrousness? Monsters are a banner under which to put what is not acceptable, but to examine, too, what is wrong, what is changing. Speculative fiction is about examination, too. There is questioning at the root of this tale of the undead. If zombies are a secondary group in society: how do we react to them? Do we accept them? And how will this change the face of a country as it shifts to accommodate a new paradigm? How do the paths of power shift and change as people fight for dominance? That said, this is no heavy-weight: fun and fanboy yurks are primary to the reading of it. It is a fresh continuation of the ever-changing monstrous fictional world. Thankfully, no one is angsting, or falling in love with a zombie and having agonies over this to the tune of several hundred pages. But if Witney wants to up his game—and if he proposes a serial, then he will have to—then cutting back on the heavy-handed self-laudatory moments and refocusing on the direction he wants to go in will help the next instalment be a leaner, wittier dessert du jour.